John Steinbeck famously described his great friend and marine biologist Ed Ricketts as follows. John Steinbeck, The Log From the Sea of Cortez (London: Pan Books, 1960): p57. Coddington Magnifiers. These are very specially shaped lenses with a deep central groove usually painted back. The groove acts as a diagphram to limit the distortions found in the almost hemi-sperical lenses. They are quite tricky to use, but because they are ground from single pieces of glass are waterproof. The figure comes from An Introduction to Applied Optics. L.C. Martin 1932. Hasting Triplets. As the name suggests they are made by bonding three lenses together. They were invented by C.S. Hastings (1879). On triple objectives with complete color correction. Am. Jnl. Sci. 18 429. 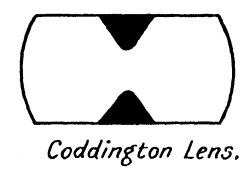 H. Coddington, A treatise on the reflexion and refraction of light. Simkin and Marshall, London, 1829. Advert for Hastings Triplet from Popular Science July 1979. The Fred Strong image of Ed Ricketts in 1935 is available Here.